Hello everyone! Let’s continue our ongoing investigation of the particles and interactions of the Standard Model. For those that are just joining us or have forgotten, the previous installments of our adventure can be found at the following links: Part 1, Part 2, Part 3. Up to this point we’ve familiarized ourselves the Feynman rules—which are shorthand for particle content and interactions—for the theory of electrons and photons (quantum electrodynamics, or QED). We then saw how the rules changed if we added another electron-like particle, the muon ?. The theory looked very similar: it was just two copies of QED, except sometimes a a high-energy electron and positron collision could produce a muon and anti-muon pair. At the end of the last post we also thought about what would happen if we added a third copy of electrons. Recall that anti-electrons (positrons) and anti-muons are represented by arrows pointing in the opposite direction. Question: What about anti-photons and anti-Z bosons? Question: What are the conservation laws of this theory? Answer: The conservation laws are exactly the same as in QED+? : conservation of electron number (# electrons – # positrons) and conservation of muon number (#muons – #anti-muons). Thus the total electron number and muon number coming out of a diagram must be the same as was going into it. This is because the new interactions we introduced also preserve these numbers, so we haven’t broken any of the symmetries of our previous theory. (We will see that the W boson breaks these conservation laws!) We also have the usual conservation laws: energy, momentum, angular momentum. So far this seems like a familiar story. However, our theory now has enough structure to teach us something important about the kind of physics done at colliders like the LHC. We started out by saying that the Z boson is heavy, roughly 91 GeV. This is almost a hundred times heavier than a muon (and 20,000 times heavier than an electron). 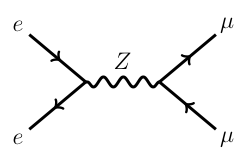 From our Feynman rules above we can see that the Z is unstable: it will decay into two electrons or two muons via its fundamental interactions. In fact, because electrons and muons are so much lighter, the Z is very happy to decay quickly into them. It turns out that the Z decays so quickly that we don’t have any chance of detecting them directly! We can only hope to look for traces of the Z in its decay products. In particular, let’s consider the following process: an electron positron pair annihilate into a Z, which then decays into a muon anti-muon pair. where M is the mass of the Z boson, p is essentially the net energy of the two electrons, and ? is a small number (the ‘decay width of the Z‘). When the electrons have just enough energy, p2–M2 = 0 and so the fraction looks like i/?. For a small ?, this is a big factor and the rate for this diagram dominates over all other diagrams with the same initial and final states. Recall that quantum mechanics tells us that we have to sum all such diagrams; now we see that only the diagram with an intermediate Z is relevant in this regime. Question: What other diagrams contribute? Related question: why did we choose this particular process to demonstrate this phenomenon? Intuitively, what’s happening is that the electrons are resonating with the Z boson field: they’re “tickling” the Z boson potential in just the right way to make it want to spit out a particle. Resonance is a very common idea in physics: my favorite example is a microwave—the electromagnetic waves resonate with the electric dipole moment of water molecules. This idea of resonance gives us a simple handle to detect the Z boson even if it decays before it can reach our detectors. Let’s consider an electron-positron collider. We can control the initial energy of the electron-positron collision (p in the expression above). If we scan over a range of initial energies and keep track of the total rate of ?? final states, then we should notice a big increase when we hit the resonance. In fact, things are even better since the position of the resonance tells us the mass of the Z. In fact, one way to search for new physics at the LHC is to do this simple bump hunting: as we scan over energies, we keep an eye out for resonances that we didn’t expect. The location of the bump tells us the mass of the intermediate particle. This, unfortunately, though we’ve accurately described the ‘big idea,’ it is somewhat of a simplified story. In the case of the electron-positron collider, there are some effects from initial- and final-state radiation that smear out the actual energy fed into the Z boson. In the case of the LHC the things that actually collide aren’t actually the protons, but rather the quarks and gluons that make up the protons—and the fraction of the total proton energy that goes into each colliding object is actually unknown. This is what is usually meant when people say that “hadron colliders are messy.” It turns out that one can turn this on its head and use it to our advantage; we’ll get to this story eventually. Until then, we still have a few more pieces to introduce into our electroweak theory of leptons: neutrinos, the W bosons, and the Higgs.